Someone is dead or someone is dying before the shark even arrives. Sharks can smell blood in the water, even if this blood is only a metaphor. In The Shallows, the shark has ostensibly been attracted to the beach by the floating whale carcass. In actuality, the shark was attracted by Nancy Adams’ grief. I am from a landlocked state and still I long for the ocean in times of stress. In Experience Life magazine, Dr. Wallace J. Nichols talks about the human connection to water in the article “Blue Mind.” He writes: “Because bodies of water change and stay the same simultaneously, we experience both soothing familiarity and stimulating novelty when we look at them.” In times of trauma, people seek out the ocean to help them heal. The trope of the sickly being sent seaside. A beach vacation in order to “get away.” The problem is when something in the ocean is also seeking out people. *Ed.’s Note: click images to view larger size. The shark movie has the same constraints as the Jurassic Park series. Why, the viewers question, do people continue to return to the island full of killer dinosaurs? Why, we ask, do we continue to get into the water knowing what lies beneath the surface? Whereas the Jurassic Park series is primarily motivated by money, the protagonists of shark movies are motivated by mourning. In Deep Blue Sea, Dr. Susan McAlester is trapped in a rapidly sinking ocean laboratory facility. It is her fault the facility is sinking. She, unknown to her coworkers, genetically modified the brains of the Mako sharks to make them smarter and with their newfound intelligence the sharks have plotted their release from the facility and into the ocean. Dr. Susan McAlester is a protagonist and an antagonist. She created killer sharks, but she did so in order to order to cure Alzheimer’s, which took her father’s life. She makes up for her gaffe eventually, by sacrificing herself to the sharks so that they cannot escape from their cage and wreak havoc on the entirety of the ocean. Her death, it seems, is karmic justice; there is, however, an additional layer: she has been freed from her suffering related to her father’s death. The sharks were not able to rid the world of Alzheimer’s, but they were able to help Susan escape her suffering. Nancy Adams, played by Blake Lively, has also experienced the loss of a parent to a slowly killing disease, only in her case it was her mother and cancer. There is existing lore between shark movies and cancer. In the SyFy channel made-for-TV movie, Hammerhead: Shark Frenzy, a father, Paul King, copes with his son’s cancer diagnosis by faking his son’s death and injecting him with hammerhead shark DNA in order to modify his stem cells and cure his cancer. Sharks, he claims in the film, are immune to cancer. To Paul King, it is preferable to turn his son into a human/hammerhead shark hybrid monster that eats people than to have him die of a disease. In the end, both father and son die. If there is any lesson to be learned here, it is that the creator of a monster shark always dies. Unlike Susan McAlester and Paul King, Nancy Adams’ isn’t trying to avenge her mother’s death. The film, set in Mexico, opens with a man driving her to a beach that her mother visited many years earlier when she was pregnant. When the man asks how she’ll get back, Nancy makes a joke about using Uber and waves him off. Later, when she calls her younger sister, Nancy gets chided for going to a remote beach in a foreign country alone. The viewer gets the sense that she is being careless with her life. It is possible that had she not been attacked by the shark, she would’ve died at the beach in another manner. Early in the film she asks the other surfers, two men, if there’s anything that she needs to be worried about. They warn her about the rocks and the stinging coral and they ask her to join them. The viewers are painfully aware that the men, more the coral and the rocks, are something that Nancy should be afraid of. The men, as it turns out, are innocuous and the beach is beautiful. Nancy Adams is lulled into a sense of safety, which is, of course, the greatest mistake a protagonist can make in a movie set in the water. I can no longer relax in any body of water. I swim a couple of times a week in an Olympic distance pool on a university campus and there are moments, when the pool is less crowded than usual and the deep end ominously blue, that I worry that there is something in the water despite any logic that would suggest otherwise. During the summer, I go open water swimming in lakes. There are things that bite in Midwestern lakes. Leeches that latch onto the skin. Giant Muskellunge armed with teeth. It is not these things that I am worried about. I am worried about sharks. All contemporary shark movies can be traced back to Jaws. 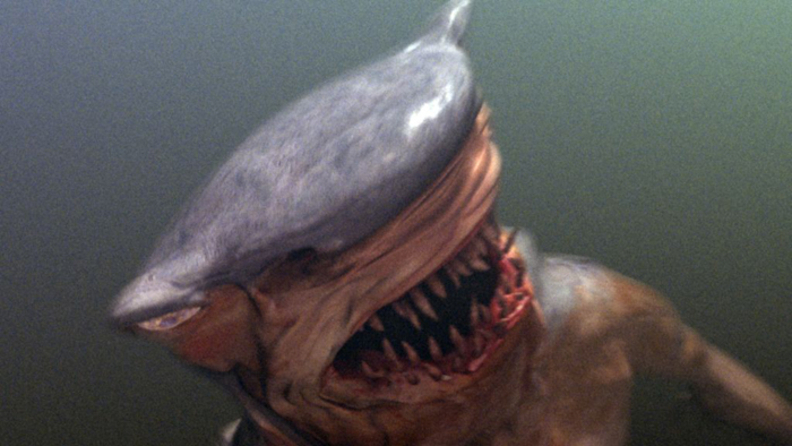 Unlike Deep Blue Sea, Hammerhead: Shark Frenzy, or The Shallows, the main death at risk in the beginning of the film is the death of the tourist season. This is the irony that the shark movie genres rides upon. It is not considered to be a brave act to enter the ocean. As demonstrating by the sweeping shots of the beach crowd in Jaws, everyone does it. Babies do it, children, mothers, fathers, the elderly. To enter the ocean is not like jumping out of a plane or to enter a house filled with paranormal activities. There are known monsters at sea, but the human need to interact with these bodies of water overrides such fears. Nancy Adams almost dies because she enters the ocean. However, it is also the ocean that enables Nancy Adams to live. It is revealed early in the film that Nancy has recently dropped out of medical school due to depression over her mother’s death. Like Susan McAlester, Nancy is distressed that she was unable to save her mother and rather than fueling her distress into saving the lives of others, Nancy uses her depression to go on a beach vacation. “Mom had to fight too hard for too little,” she tells her father on the phone before angrily reentering the surf. Of the many questions the movie doesn’t answer, how Nancy gets such good phone service on a remote beach is one of the bigger ones. Once out on the water, Nancy sees birds circling something in the distance. They are circling a literal dead whale and they are also circling Nancy’s sadness and anger over her mother’s death. It is easy to consider dying while not actually dying. When I was a teenager, I liked to take baths and told my head under the water for as long as I could in a pretend act of drowning. The shark makes death real in a way that it never was before. Nancy Adams, who had no will to live at the beginning of the movie, suddenly discovers her passion for life once she is stitching closed a giant shark bite in her leg using the necklace and earrings that she so conveniently wore for her surfing trip. Gangrene starts to settle in her injured leg and at times, the camera shots become blurry to indicate fading lucidity due to infection. 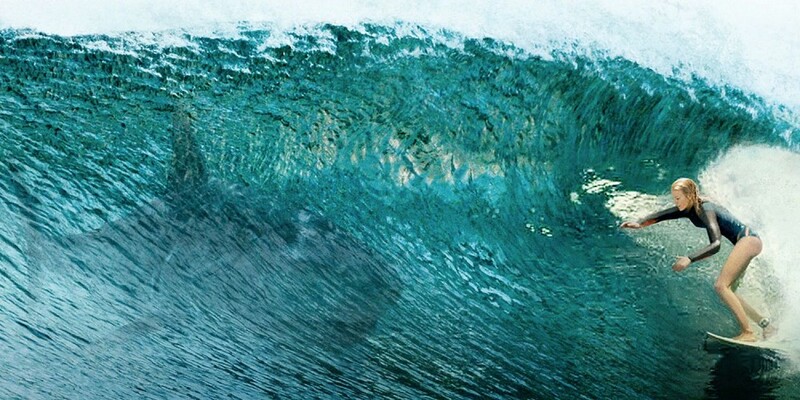 When the shark arrives, the shots become crystal clear. It is only the appearance of the shark that can pull Nancy Adams out of her stupor and make her fight for her life. She is not living despite the shark, she is living because of the shark. It is difficult to try and categorize shark movies. They are most closely related to the horror genre, though traditionally shark movies have always included moments of humor. In an article for Wired titled “Forget Jaws. The Real Shark Movie to Beat Is Deep Blue Sea,” Brian Raftery argues that, “Jaws isn’t really a shark movie at all … there are long stretches in Jaws in which the titular hunter disappears, and the movie transforms into a sharp examination of the petty, sometimes predatory behavior of the people on land.” I disagree with Brian Raftery in that I think that all shark movies can be traced back to human nature. Shark movies are exciting because they are about a real monster, albeit a mostly harmless one. Sharks, in general, are not a threat to humans. Any casual viewing of Discovery Channel’s annual Shark Week makes clear that humans are the real enemy to the shark. And yet, the water remains an ever dangerous and alluring place. We are drawn to that space where our true nature is test, the space where we become more prey than predator. Nancy Adams kills the shark with human ingenuity, of course. Just as the shark in Jaws was killed by an air tank and the shark in Deep Blue Sea killed by an electric current, Nancy manages to lure the shark to the bottom of the ocean where it impales itself on metal rods. The film ends with Nancy, now Dr. Adams, looking out over the beach in Texas with her father and sister. At first, the viewer assumes that she is afraid to go into the ocean, a very reasonable fear. Dr. Adams surpasses our expectation and runs into the ocean. It is clear that this time she will be safe as she is no longer haunted by the demons of her mother’s death. Sharks are not a cure for cancer or Alzheimer’s, but they can be a cure for grief. Once the protagonist has looked down the shark’s gullet and faced their own mortality, they gain a new appreciation for the life that they lead. The shark is like a maggot for sadness. Maggots will eat the dead skin off a wound and leave what’s living. 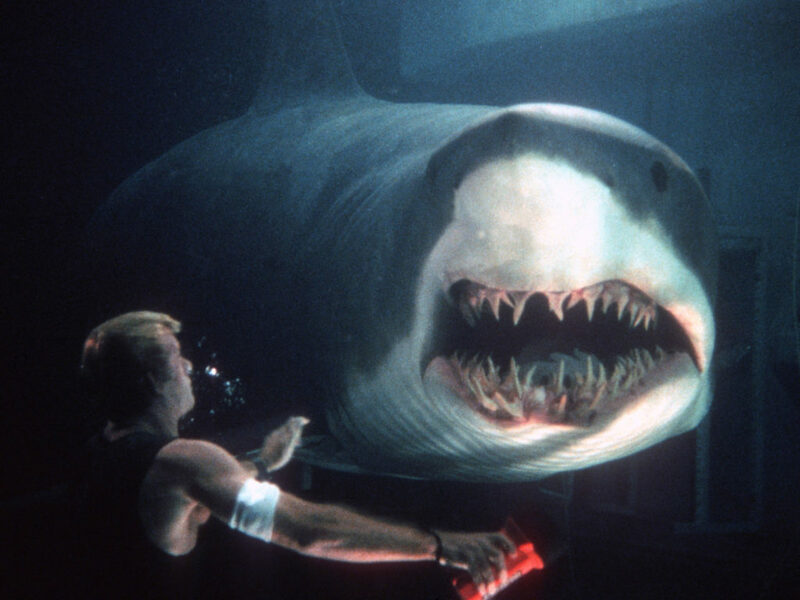 The shark will eat several other people in the movie, many of them endearing despite being nameless, and leave the protagonist alive to live a better life. 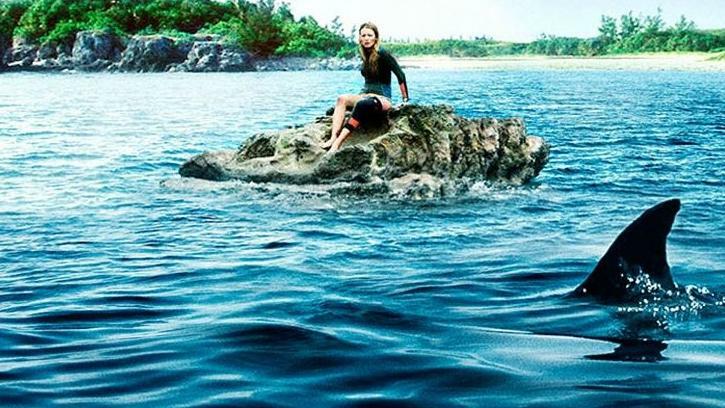 Boiled down to its base, The Shallows is a movie about how a killer shark enabled Nancy Adams’ to process her grief and finish medical school. We return to the water because it is the fear of it that enables us to cleanse ourselves of our troubles. There is a certain thrill of watching our feet dangling, those infamous shots from Jaws, knowing that there are creatures waiting below to take a nibble. The ocean is pleasurable because it makes us feel so small. The ocean is pleasurable because we know it has the power to kill us and revive us and we will come back to it again and again.